Glial cell-derived neurotrophic factor (GDNF) plays an important role in renal development, serving as a trophic factor for outgrowth of the ureteric bud and its continued arborisation. 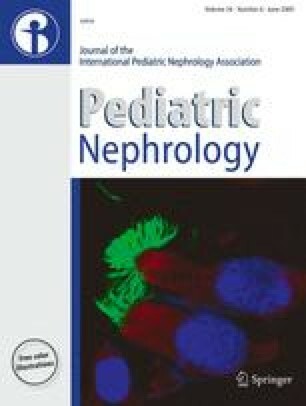 Our previous studies have shown that common variants of the human paired-box 2 (PAX2) gene (a transcriptional activator of GDNF) and rearranged during transfection (RET) gene (encoding the cognate receptor for GDNF) are associated with a subtle reduction in the kidney size of newborns. Since heterozygosity for a mutant GDNF allele causes mild renal hypoplasia and modest hypertension in mice, we considered the possibility that common variants of the GDNF gene might also contribute to renal hypoplasia in humans. We studied the relationship between newborn renal size or umbilical cord cystatin C and 19 common GDNF gene variants [minor allele frequency (MAF) >5%], three single nucleotide polymorphisms (SNPs) related to a putative PAX binding site and one rare SNP (rs36119840 A/G) which changes an amino acid (R93W), based on data from the haplotype map of the human genome (HapMap). However, none of these 23 SNPs was associated with reduced newborn kidney size or function. Among the 163 Caucasians in our cohort, none had the R93W allele. This work was supported by an operating grant from the Canadian Institutes of Health Research (MOP 12954) and an infrastructure grant to the McGill University Health Centre Research Institute from the Fonds de Recherches en Santé du Québec. Studies were conducted with the informed consent of the subjects and the approval of the Montreal Children's Hospital Institutional Review Board (PED 04-016). Dr. Goodyer is the recipient of a James McGill Research Chair.